In our passage this morning the Apostle Paul draws to a close his letter to the small Christian community in Ephesus, giving a rousing pep talk to his readers to “stand firm.” As a small, oppressed minority they would have been very familiar with the armor worn by the legion of Roman soldiers who marched through their city to maintain with the threat of violence what was known as “Pax Romana” – the peace of Rome. The ultimate expression of that violence was the crosses upon which those who rebelled against the divinely sanctioned authority of Caesar were gruesomely crucified. Paul draws upon the image of this armor worn by the Roman soldiers for a metaphor of what it means to “stand firm” in the face of the present powers of darkness. The metaphor was deeply ironic, for the one these early Christians proclaimed “Lord” – the one, true son of God – had refused to take up arms and embrace violence, and had willingly died upon one of the Romans’ crosses. It is, however a metaphor that can easily be misused. In the middle ages the image of the full armor of God was one used to rally the soldiers of the Crusades who marched to the Holy Land to take up literal swords to slaughter Muslims with the promise of heavenly rewards. These days in some Christian book stores you can buy a plastic suit of armor for $30 known as “The Full Armor of God” for boys ages 3 and up. It’s safe to say that the boys wearing this armor aren’t particular tuned into the metaphorical meaning Paul had in mind and instead enthusiastically imagine themselves killing bad guys. But as I read Paul’s words, note that the full armor of God is in service to a “Gospel of peace” – not violence – and listen for who it is the apostle declares to be the real enemy against whom we are struggling. Listen for the word of the Lord. Finally, be strong in the Lord and in the strength of his power. Put on the full armor of God, so that you may be able to stand against the wiles of the devil. For our struggle is not against enemies of blood and flesh, but against the rulers, against the authorities, against the cosmic powers of this present darkness, against the spiritual forces of evil in the heavenly places. Therefore take up the full armor of God, so that you may be able to withstand on that evil day, and having done everything, to stand firm. Stand therefore, and fasten the belt of truth around your waist, and put on the breastplate of righteousness. As shoes for your feet put on whatever will make you ready to proclaim the gospel of peace. With all of these, take the shield of faith, with which you will be able to quench all the flaming arrows of the evil one. Take the helmet of salvation, and the sword of the Spirit, which is the word of God. Did you notice who Paul says is their real enemy was? “Our struggle,” he says, “is not against enemies of blood and flesh, but against… the the cosmic powers of this present darkness, against the spiritual forces of evil in the heavenly places. As easy as it is to see the enemy as particular flesh and blood people who seem to have it in for us, Paul says they aren’t the real enemy. The real enemy is the devil – the “Father of lies” who deceives people into doing his bidding. “Father forgive them, “the savior had declared as he was dying, “for they (the flesh and blood people who conspired to nail him to that cross) “know not what they do.” They have been deceived into committing this evil by the evil one. In the 20th century the person who most clearly made this distinction was Martin Luther King, Jr. In the civil rights movement as folks marched against more freedom it wasn’t the goal wasn’t to defeat Klansmen and such who brutalized them. The goal was to free them from the evil of racism that they had absorbed from the larger culture. They too needed liberation from the evil that possessed their hearts. As King saw it if they allowed themselves to be taken possession of by hatred in face of the hatred directed at them they would be in danger of losing their souls in this great struggle. And King cautioned that it would be a long hard struggle they were engaged in and therefore perseverance was the key because as Paul says, it is not our job to defeat evil itself. It would be naïve, perhaps arrogant on our part to think ourselves capable of doing so. The ultimate victory over evil is God’s doing, not ours, and we believe that defining battle was won when Christ allowed himself to be nailed to that cross. Our job is simply to stand firm and not to succumb to evil itself and to do this we need to put on the full armor of God. What would succumbing to evil look like? I think it could mean a variety of things. As King warned it could mean our hearts being taken possession of by hatred and bitterness. It could mean by succumbing to either greed or fear in such a way that we are led to do evil things. For those early Christians in Ephesus, it must have been easy at times to see themselves as pretty irrelevant to the culture at large and feel the temptation to simply give up. Their neighbors mocked them for their peculiar ways. And with the Roman legions marching through their city it was easy to see who held the power in this world, and it wasn’t them. I suspect all of us here this morning know something of this temptation, and have at times “given up.” But the race we are running is a marathon not a sprint, and hopefully eventually after our times of despair we have found the strength of the Lord to once more stand up and stand firm. The temptation can come in different forms. It comes to us in very personal ways with the decline of our health or that of our loved ones, in the loss of loved ones, in financial setbacks and the betrayals of trust. It comes in more public, less personal ways: the temptation to despair over the ineffectiveness of our political leaders to work together to solve problems, by the corruption of politicians through the love of money, and the increasingly cavalier attitude on display about telling the truth. For me one of the forms the temptation comes to me is the fact that over the last fifty years the Church in America has been in a steady statistical decline. There was a time back in the years immediately following World War II when as the saying goes, “if you build it, they will come.” The majority of Americans attended worship on Sunday mornings. But then the direction of the culture changed course and ever since there has been a steady decline in church attendance across all denominations ever since. Nowadays only minority of Americans – 40% — identify themselves as “regular church goers.” This may be a stretch because on any given Sunday only about 20% of us are in worship. Since 2000 there has been an acceleration of this decline with church attendance declining at a rate of 1% per year. In partnership with you, I’ve spent the last 30 years of my life devoting myself to building up the body of Christ here at the Parsippany UMC. Week after week we’ve plugged away but in spite of our best efforts through the years we’ve seen our worship attendance slowly but steadily decline. Frankly, I get discouraged. The one exception to this national trend is in the mega-church model that was developed back in the seventies and the fact of their growth in the face of our decline fosters a sense of irrelevancy on my part, perhaps yours as well. We now have one right here in Parsippany: “The Liquid Church.” There are some very commendable things about these churches. Lives are changed for Christ. They do good work to care for the broken in this world. There are certain qualities they share that lend to their success. Their worship services are fast paced with professional quality attention given to lighting, sound and music focused on maximizing entertainment and the determination to keep a visitor from ever experiencing boredom. There are large crowds that foster an atmosphere of anonymity and help create the feel of a rock concert. You can come and take in the good and inspiring vibes of their show without having any demands placed upon you to interact with other people in a significant way. To their credit they effectively open up pathways to visitors for deeper engagement in small group studies and mission projects. There is much we can learn from mega-churches. But we can’t be a mega-church – that’s simply not who we are. And we aren’t likely to ever become a mega- church. But in comparison their success can leave us feeling a sense of inadequacy and irrelevancy. In the face of this particular form of discouragement, I have identified a hero who models for me what it means to stand firm. It’s Mr. Rogers. You may be familiar with the fact that Fred Rogers attending a seminary in Pittsburg and was ordained a Presbyterian minister. Early on he recognized the power of TV to shape culture, and in particular the minds of young children. He was distressed by the typical fare offered to children – fast paced cartoons often filled with violence. No consideration was given to how the programming didn’t respect the fragile and formative nature of childhood. He resented the way TV was focused on raising up good consumers rather than good people. And so for thirty years Fred Rogers offered a daily television program that bucked the trends of popular culture. The pace was intentionally slow. He ignored the special effects that the advancing technology of television made possible and spoke softly, slowly, reassuringly directly to children in their homes. And for all this he was often mocked. But week after week it was the same routine. *He’d sing the same opening song about “please won’t you be my neighbor” – a Biblical theme if ever there was one taken directly from Jesus’ parable of the Good Samaritan. He didn’t shy away from the troubling things that were going on out in the world. During the thirty year run of his show no-fault divorce became the norm and with it increasingly common for families to be fractured, he spoke in that same calm reassuring voice about what divorce was with the message that it was a hard thing to go through but that they’d be okay. 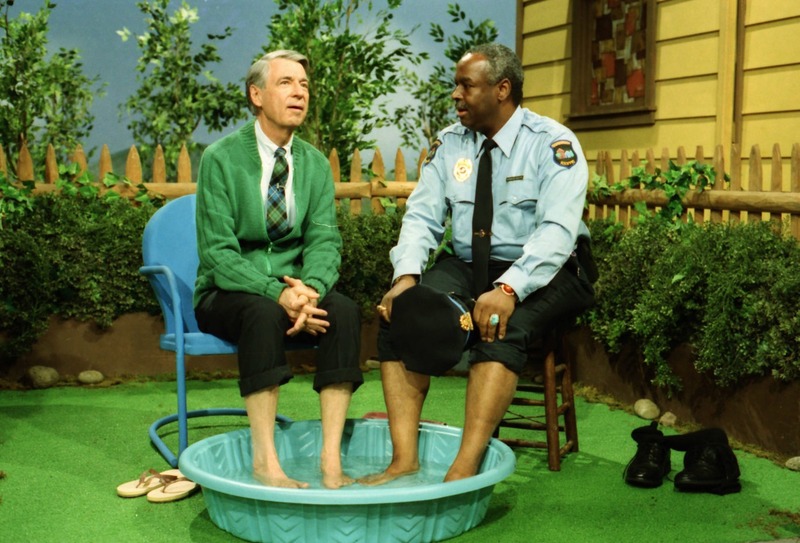 During the civil rights movement when black people were being kicked out of whites only public pools, he intentionally staged a scene in which he invited African American Officer Clemmons to share a wading pool on a hot summer day. Afterwards, in an intentional modeling of Jesus Fred dried the feet of his friend with a towel. After the murders of Martin Luther King and Bobby Kennedy Fred explained “assassination.” With his calm, reassuring manner he acknowledged the scary things that kids were already worried about, giving them permission to feel the feelings that arose, while conveying the message we’ll get through this together. Fred had his own struggles with self-esteem and depression. He grew up an only child who spent a good deal of time alone, using his imagination to entertain himself, the same imagination he would put to such good use later on. He was overweight and often teased by other children. So when he told the kids at home that they were special, just the way they were, he was taking up “the shield of faith with which” together we “quench the flaming arrows of the evil one.” You know those flaming arrows – the voices that live inside our head that came from who knows where that tell us we are unworthy. Fred’s puppet, the Daniel tiger was a surrogate for his own vulnerable self susceptible to those flaming arrows, and his calm voice of reassurance the shield of faith. In recent years Fred Rogers has been blamed by some critics for helping to create a generation of entitled adults who don’t feel the need to work hard to achieve because they’ve already been told they are special. But that is non-sense. Fred was simply proclaiming the Gospel to children. Their worth was God’s gift to them – they were lovable already and didn’t have to be somebody different from who God made them to be become inherently valuable. And out of that wellspring of love that takes hold within us we grow up to be grateful, loving contributors to our communities. Unlike the way of this world, our worth is not located in our ability to beat down the people around us. Fred Rogers brought his television show to a close after thirty years, just months before 9/11. How the pace of life has increased all the more intensely in the subsequent years. How we miss his reassuring calm voice that slows life down to a livable pace. So returning to our little church that often can seem irrelevant – out of step with our times and the temptation to despair as our numbers slowly shrink. I take comfort in the example of Fred Rogers steadfastly showing up, standing up with the full armor of God, ignoring the fact that so many judged him foolishly out of sync with the direction our culture was moving. Turns out, he was the real deal. And in spite of appearances to the contrary little communities of faith like ours are just what the world needs right now. We are the real deal: a community that gathers together each week to care for one another and hear yet again the old story of Jesus and his love… a community that encouraging one another to keep on “standing firm” in the face of the powers of darkness.